Q1. Kendo looks hard. Can I keep up with the practice? Q2. What is the relationship between BUTOKUDEN and E-BOGU? Q3. When can I visit and see your class? Q4. Is my child too young to start Kendo? Q5. 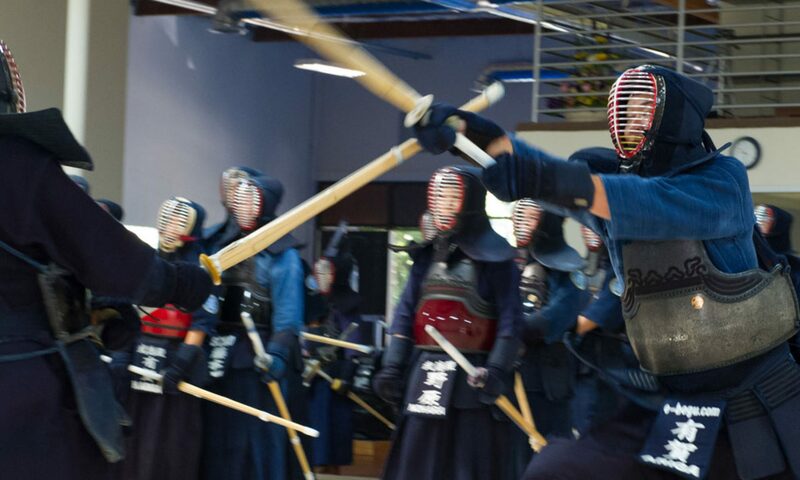 Am I too old to start Kendo? Q6. How many classes per week can I attend? Q7. What are initial costs to become a member? Q8. What are monthly fees? Q9. What othe costs are involved? Q10. Who should I contact to ask other questions? Q11. What are the questions for SCKO promotion exam? Don’t worry. Our instructors teach you as your level. If you are beginner, you start learning the very basics such as how to bow to the opponent, how to do Seiza, or how to wear the uniforms at first. E-BOGU.COM, Inc. is a world leading Martial Arts equipment supplier. E-BOGU backs Butokuden 100%. E-BOGU provides large discount to BUTOKUDEN members on all equipment. Q3. When can I visit and see your Kendo class? You can come watch any of our scheduled Kendo classes. No prior appointment is required. Check our latest class schedules at www.butokuden.com. We also encourage you to experience our free trial classes. You can join our class with any sporting outfit. Our youngest member right now is 6 years old, and he is doing well. They have to behave well, and be able to listen to the Senseis directions. Kendo is for life. Whenever you want to start Kendo, it is time to start. We have members from 6 years old to over 60 years old. We currently offer 3 classes per week: Tuesday, Wednesday and Thursday. On Tuesdays and Thursdays, the first half is focused on basic drills, and the second half is Jigeiko (sparring with each other). Beginners will have its own lessons focused on very basic motions, so you can get ready to participate in a more advanced class. On Wednesdays, we have an open practice, which is Jigeiko only. We usually have visiting Kenshis from other Dojoduring our Open practices. After you start wearing your Bogu, we encourage you to come not only on Tuesday or Thursday but also on Wednesday as you can improve much faster. Uniform (Kendogi & Hakama): It depends on which uniform you want to have. Ask the instructors when you join. Family members get 10% discount. You are required to pay for the next month’s tuition at end of each month by credit card (charged automatically) or check (payable to BUTOKUDEN, Inc.). Q9. What other costs are involved? 1) Equipment: After you practice for a few months, the instructors will tell you to put on your Bogu. The price of the Bogu starts around $350 for the set. 2) SCKO (Southern California Kendo Organization) and AUSKF (All USA Kendo Federation) annual membership fees: Please check here for fee details. 3) Tournament/Promotion exams: Participation fees are required when you participate at tournaments and promotions exams. Send an email to kendo@butokuden.com. Or, you can ask any instructors at our facility before or after a class.  Describe the benefits of the Kendo kata （剣道形）검도형 and its relevance to shinai keiko　（竹刀稽古）죽도계고;.